The Staircase To Nowhere. Summer 2013. 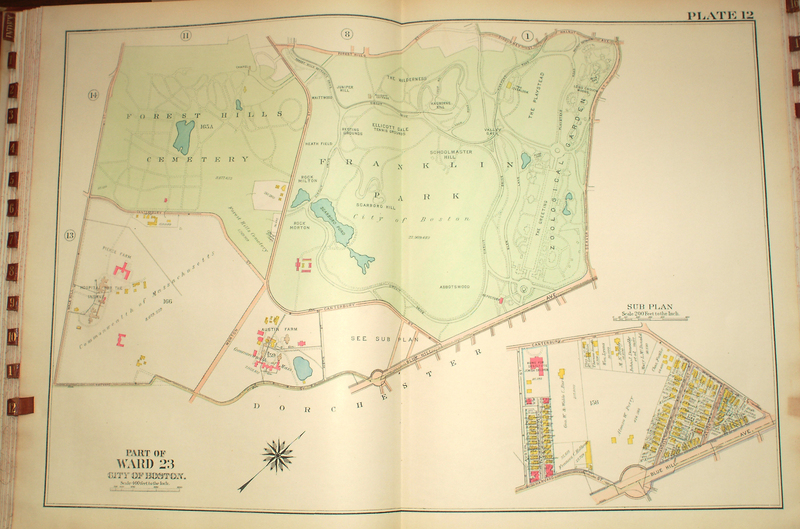 A map from 1914 showing the Resting Grounds and Scarboro Pond. Via JPHS. Walking along the path in Franklin Park, there is a stretch of densely wooded area between the Resting Grounds1 tennis courts and Scarboro Pond that I pass through frequently. 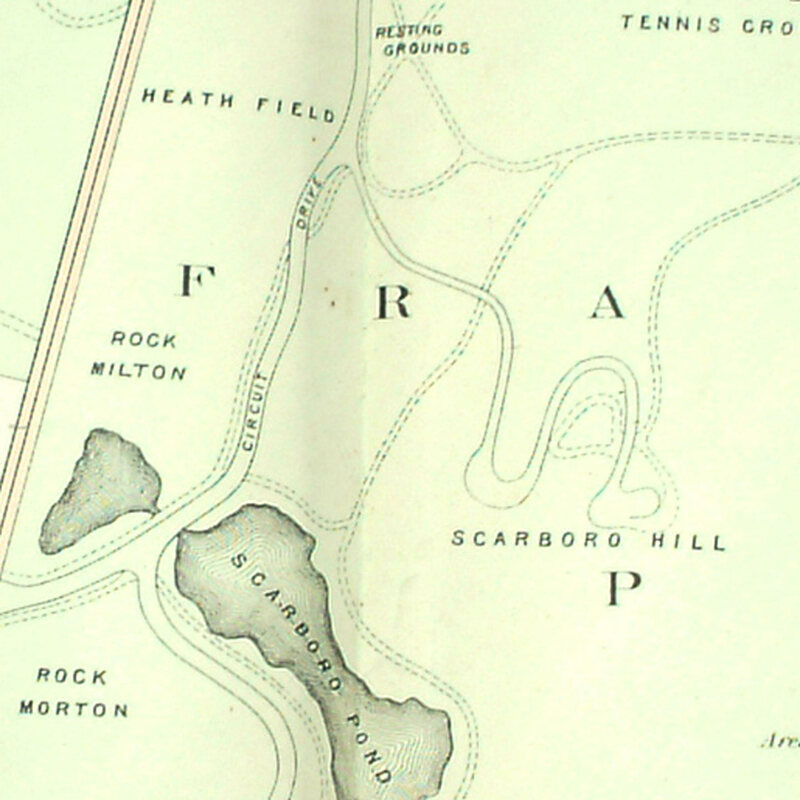 It runs along the base of Scarboro Hill, and from a Park-history perspective I’ve never paid much attention to it. No maps show any buildings or interesting features in the woods, and there are no postcard views of any attractions like there are for other parts of the Park. 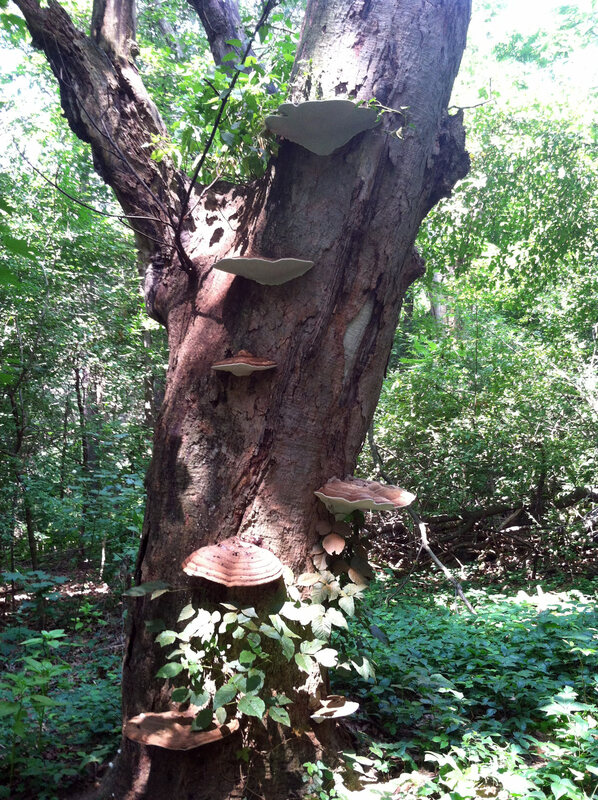 Instead, it is just a densely wooded stretch with birds and trees and squirrels. So imagine my surprise this past November when I was walking along the path and looked into the woods to see a stone staircase, high up on the hillside! With the leaves off the trees, I could see into the dense woods and there it was. I had to climb up a steep slope that was probably 10 feet high, where I found myself on a flat area that was pretty obviously man-made. With the leaves gone, I could see that the ground sloped up from the direction of the Shattuck Hospital, as if a road or path had come up this way, and then it abruptly stopped. Just before the end of this graded dirt was the staircase, climbing up the slope to another flat spot. 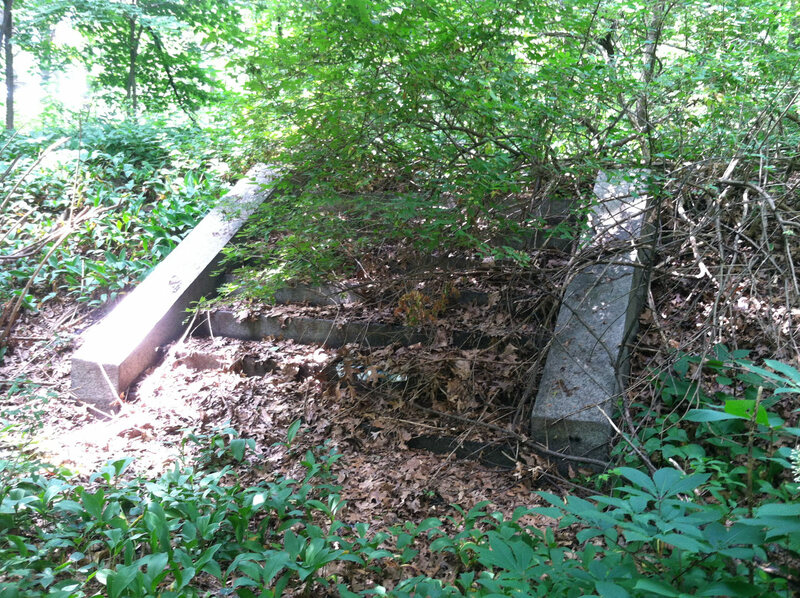 The whole area is covered in trees and overgrowth, and when I returned this week I had a lot of trouble finding it2. Looking around, I can say that there is absolutely nothing there to indicate why the stairs exist. The ground is completely overgrown with ivy and thorns and weeds. The trees are quite tall and seem to have been there a while. A footpath and some empty beer cans indicate that it’s not completely unused, but I can’t really imagine what was here in these thick woods that warranted building a stone staircase. Here, I must admit that I didn’t just wander up into the woods this week, in the heat and humidity of summer, just to stare at these stone steps. There were too many bugs for that. I was there for a reason. Compare that detail with the map at the top of this post, which is from 1914. What is important is the building on top of the hill above Scarboro Pond! It’s in the fold of the map, so I didn’t notice it at first, but there it is. 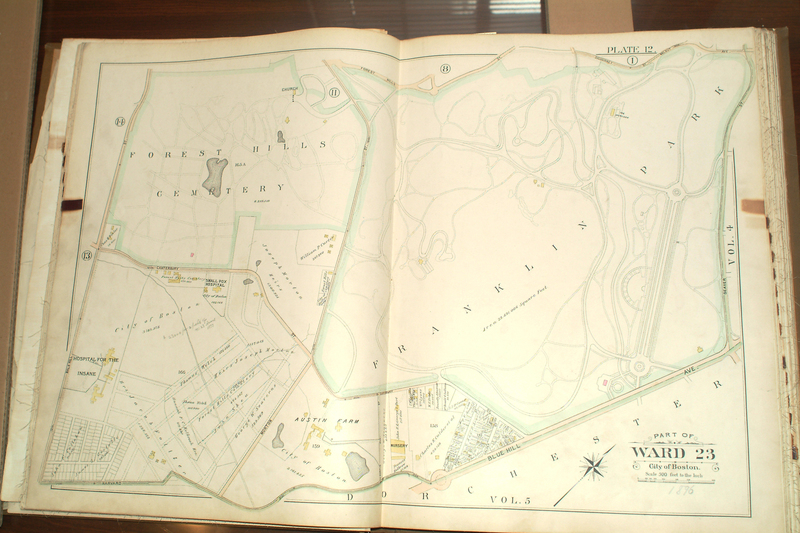 Looking over the various maps I can find, it is only this 1899 map that shows a building on that hill. Below are details of the same section of the map, taken from each version available from the JP Historical Society — 1896, 1899, 1905 & 1914. Detail of 1896 map of Franklin Park, showing the Resting Grounds and Scarboro Hill. 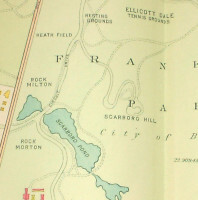 Note that Scarboro Pond is not shown on this map. The 1899 detail shown above. Note the building near Scarboro Pond. 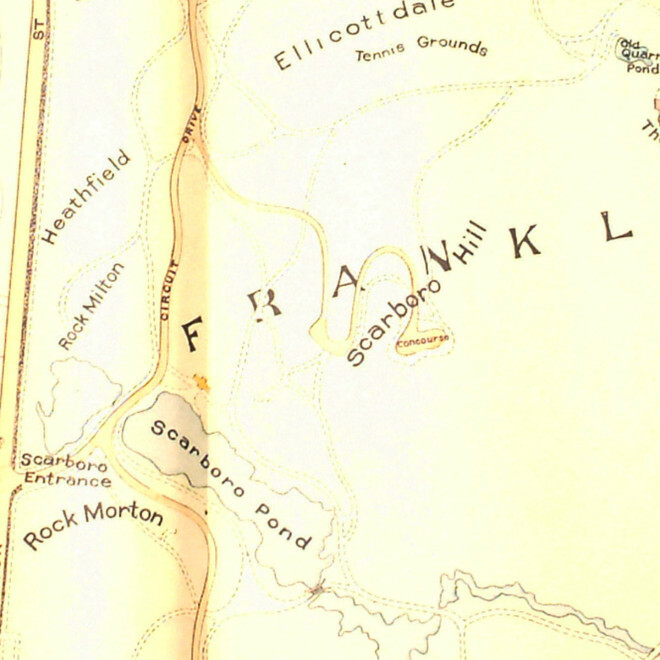 Map detail from 1905. 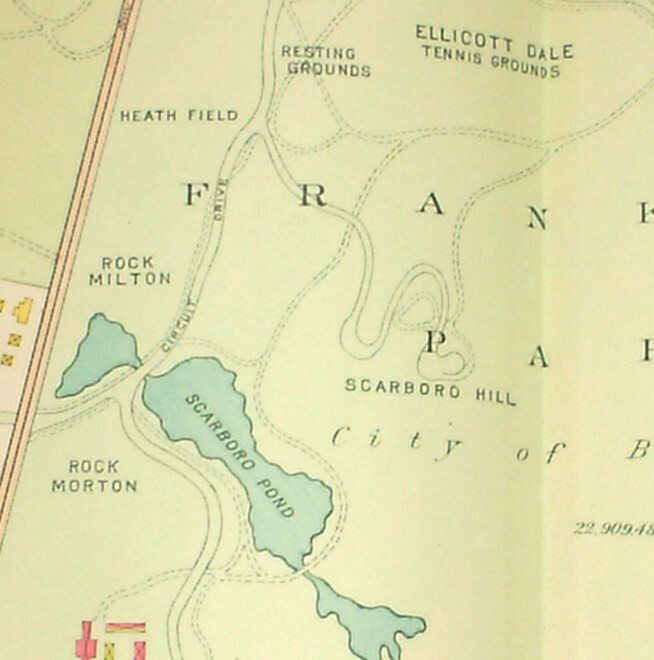 Notice that the building near Scarboro Pond is absent in this map. Map from 1914, as shown above. No building near Scarboro Pond. I don’t know what the building was or why it was there. That remains a mystery… okay just about everything here remains a mystery. 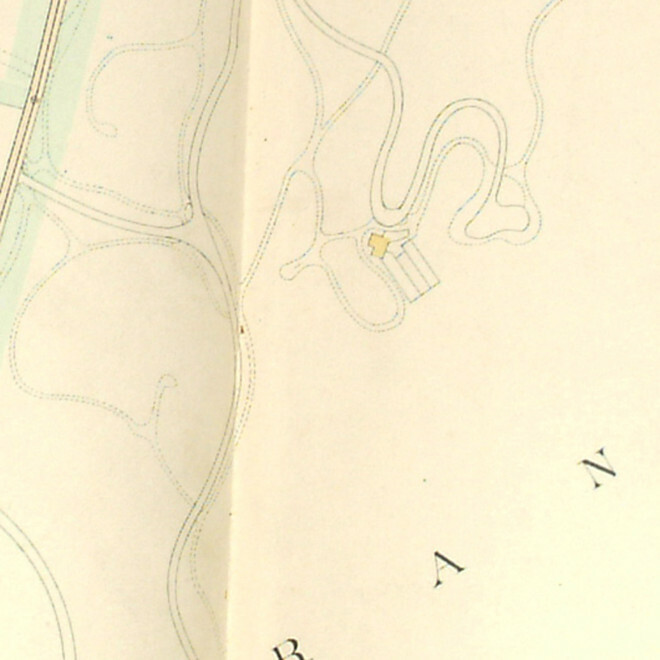 What was built on this hill after the 1896 maps were drawn, and was removed before the 1905 maps were drawn? I know from some other research3 that these maps have a discrepancy of about 10 years on either side. So (assuming some maps aren’t just omitting the building) it is possible a building was on top of the hill from about 1886. It seems impossible to me that a building on one map would not appear on a subsequent map unless it was torn down, I’ll assume the building was removed sometime before 1905. Work on the Park began in 1885, it would make sense that the structure dates to around then, and hung around for 20 years. The flat, open area at the top of The Staircase To Nowhere, overgrown in summer. It also makes sense that there would have been a building up on top of the hill if you follow the footpath down to the water. From the top of the stairs it’s hard to see any view, but as you descend the view of Scarboro Pond opens up and is quite lovely. I bet in 1885, when the trees were cleared away, the view was spectacular. The view of Scarboro Pond, descending from the hill and The Staircase. BUT WAIT! As I noted in my previous post about the Lily Pond, Scarboro Pond was not part of the original Park plans and was added later. In fact, the Annual Engineering & Construction Reports show that the Pond wasn’t completed until 1891. 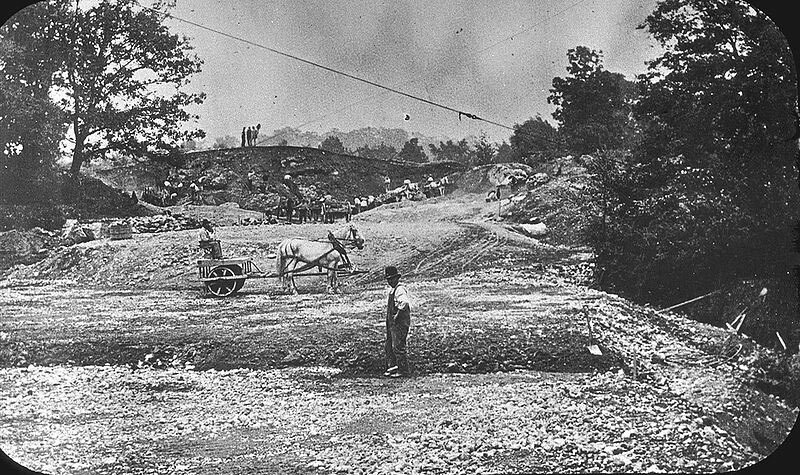 Undated photo showing men working in Franklin Park. It appears that they are building the foot bridge over Scarboro Pond – note the island to the left. Probably late-1880s? It seems to me – and this is just an educated guess — that the building shown on the 1899 map was not for Park guests, but related to the construction of Scarboro Pond. It appears on the maps at roughly (accounting for the delays of cartography) at the time the crews are building the Pond. It disappears at roughly the time the Pond is completed by connecting it to the reservoir on Hagborne Hill. Unless it was destroyed by fire (a common fate for Franklin Park buildings, sadly) my guess is that the building was removed when it was no longer useful. While wandering around in the woods at the top of The Staircase To Nowhere, I’d have to guess that it wasn’t fire that removed the building. This is only a hunch, but I know that all the other buildings in the Park that burned have left behind some remnant. The Overlook is still very easy to find, and if you know what you’re looking for the foundation of the Ellicott House can be seen in the ground. However, on top of The Staircase, there is nothing to see. In fact, the only remnant of any kind of building is a hunk of ceramic plumbing, probably the drain from some toilet facility, sitting strewn in the weeds. 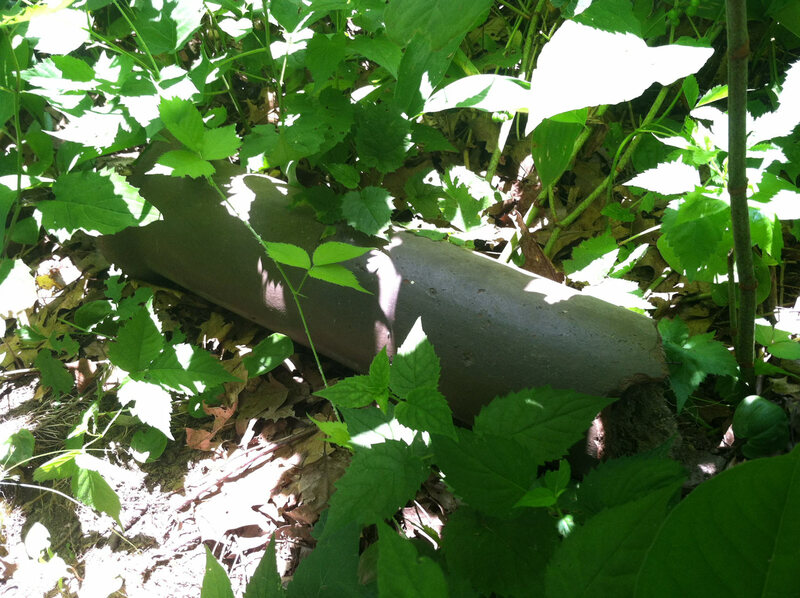 A chunk of ceramic pipe near The Staircase, the only remnant I’ve found of any building here. As I walked out of the woods and took one last look at The Staircase To Nowhere, I felt pretty confident that I’d figured out what was once here. Yet, something didn’t feel right. Something was off. The Staircase. Note the clean edges and lack of Puddingstone. Everywhere else in Franklin Park the stone is rough and worn, reflecting Olmsted’s vision that all man-made elements feel “natural.” Roxbury Puddingstone is used wherever possible, and the granite stones of the 99 Steps and The Overlook are raw, lacking that clean sharp edge of a modern stone. However, the stone of The Staircase To Nowhere is clean and sharp, modern-looking. It’s out of place in Franklin Park. It’s not what Olmsted would have wanted. I can’t really explain this. In context, the maps show a building where the steps would lead, and the building exists only around the turn of the last century. Maybe the steps were only intended to be temporary, like the building? Maybe the whole facility was just there for workers building Scarboro Pond, and Olmsted didn’t obsess over the details because he knew it was going to be torn down? Maybe it is one of those things… stairs were needed and built without any attention to the style? I can’t really say anything for certain. In fact, everything I’ve written here is speculation. All I know is that you can go stand in the woods, on top of a hill covered with trees and ivy and mushrooms, and climb a stone staircase to nowhere. If there is any meaning to be made of that climb, it is up to you. The view from the top of The Staircase To Nowhere. – The Resting Grounds, along the edge of Heathfield where the Shattuck Hospital sits, are the field where American soldiers camped after the Battles of Lexington and Concord. The British were surrounded on the Boston peninsula, and the Roxbury Neck is only a mile away, down the main thoroughfare now known as Washington Street. 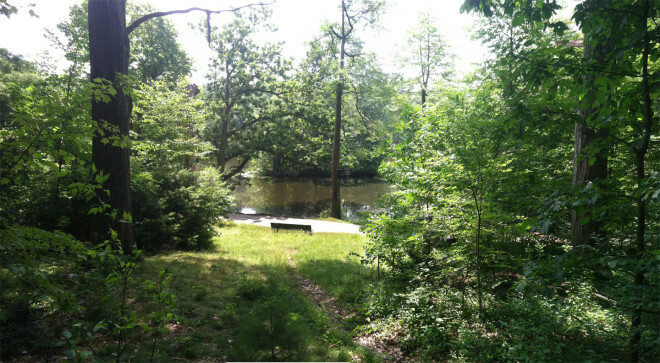 – If you want to find the Staircase To Nowhere on your own, walk down the path that connects the Resting Area and tennis courts with the Pond. Near the Pond the path slopes downward, and there is a fire hydrant on the east side of the path. If you go into the woods on the opposite side of the path and walk straight, you’ll eventually see the stairs. – Without going into too much detail, other maps from the JP Historical Society from the same sources show the street where I live. 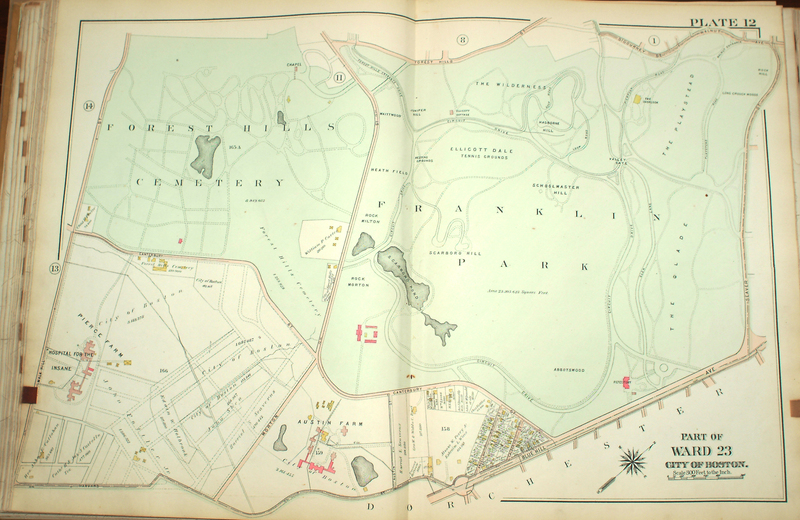 The 1914 map shows that the lots had been planned, but no houses built. However, my deed states that our house was built in 1905. The discrepancy is likely due to the amount of time required to draw up maps of a complex urban area like Boston. I’m assuming the same logic applies to the maps of Franklin Park. 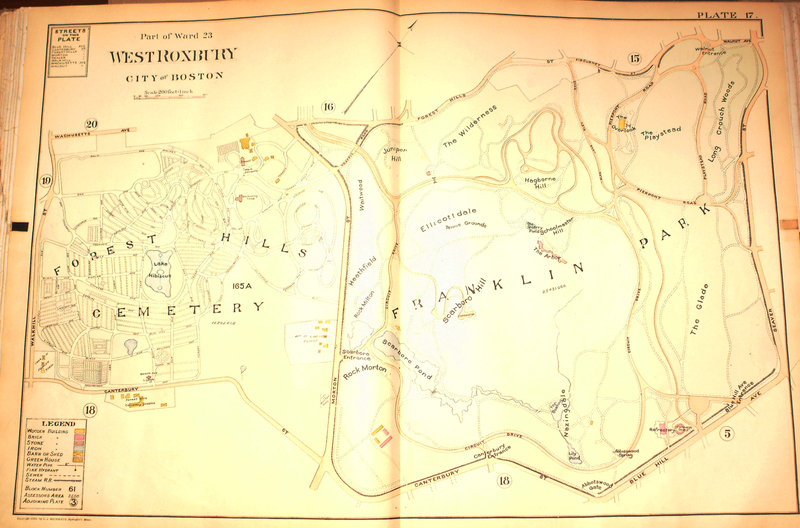 The blog Remember Jamaica Plain has a better reproduction of the 1899 map that shows the building in question. 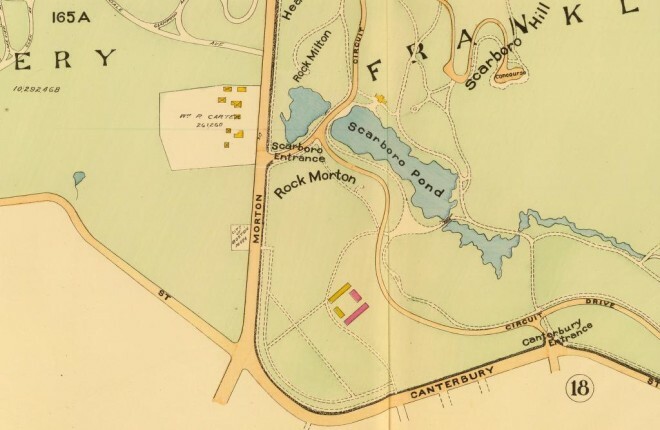 Below is an image taken from their site, and here is a link to the full post that features some great articles from the 1890′s & 1900′s about the making of Scarboro Pond.